During another all day gaming session I popped into the veggie cafe on the corner to grab some teas (it's snowy and cold in the UK at the moment - by our standards anyway) and spotted this solitary can hiding behind the counter. I'm not sure if it's a big brand, or a new brand but I figured I wouldn't turn down the chance to try it so I bought one (with a couple of their home-made cookies) to take back to the gaming tables. 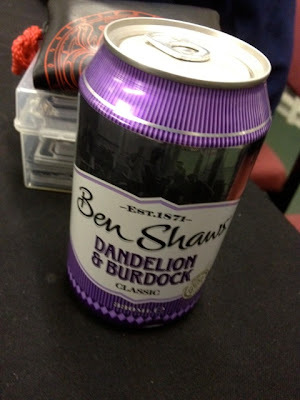 The can says that they have been going since 1871 and what I originally thought in the picture was a reflection of the games shop is actually a picture of an old style factory setting where presumably this drink was made. The odd thing is that this is very much a 'pop' style drink like a Dr. Pepper or a Pepsi and not at all like the Fentiman's D&B that my brain is now accustomed too due to its rise to sit alongside their cola as one of my favourite drinks. I think that this isn't a bad thing, not everyone likes the earthy undertones that this drink can have and a sweeter, brighter version is quite welcome. It was very refreshing and despite being the standard 330 ml seemed a very small can as I'd have happily drunk more. I'm not sure I’ll ever see more in this range, but as I plan to go back to the cafe to try out their veggie all day breakfast including avocado bacon (?!) then hopefully I'll get to see some more traditional drinks with a modern style. I won't suggest that you've been living under a rock NLi10, but Ben Shaw's Lemonade has been a favourite for years. A little harder to find than R Whites, but delightful when you can. Not tried the lemon ones, so will try and hunt them down. The Toffee Dodgers are yum if you can find them. Had the lemon ones - did I not write that up?! I think that was with the two colour ones too. Brain fail. Will add to stack. Genuinely not seen Ben Shaw's Lemonade here in the midlands!